Production on Manny and Khan is going swimmingly. Now despite what you may think, Khan is not actually a leprechaun, but in fact a small man who dresses like a leprechaun because he thinks its cool. And Manny, who's been refered to as "a giant platypus", is actually a Man-o-puss; half man half platypus. 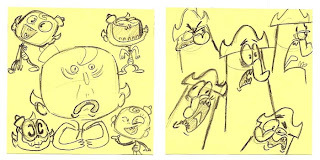 Stay tooned for more post-its and updates on Manny and Khan. And for further research check out Joey's blog. 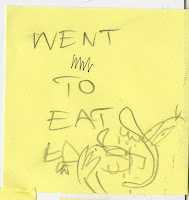 One individual at Cartoon Network who really helped mentor me and Joey through The Awesome Chronicles is the incredibly talented story-master Derek Dryman. He was more than willing to tackle any of the questions we could come up with, and always had a brilliant and sensible answer. In addition to his wealth of knowledge, Derek is also one of the nicest people I've ever met. Below; Random Flap and K-nuck doodles I did during work.